Looking for an item that can hold wine and or groceries? 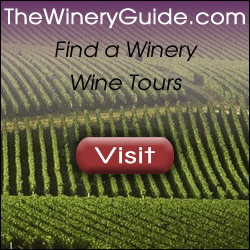 Great for wine related events, wine shops, wineries, wine tastings. The Y2K Wine and Grocery Tote Bag with Color Evolution imprint is the answer. Made from 110 GSM non woven polypropylene,this bag includes 4 interior bottle holders and two pockets. With a poly board inserts included for extra strength, 22″ dual reinforced handles extending to bottom of the bag, this bag is ideal for shopping, picnics, gift bags and carryouts. When not in use, bottle holders will just fold in. One bottle holder has two pockets to hold coupons or small items. Bag is 10″ x 13″ x 15″ Min 100. 4.65 ea, 300 3.55 ea, 500 3.29 ea. 1000 2.99 ea. 3000 or more 2.89 ea. Set up is 50.00 per location. Imprint area is 5″ w x 10″ h back or front sides or 3″ x 7″ gussets. Bag colors: Black, burgundy, navy blue, royal blue, red, teal or tan. 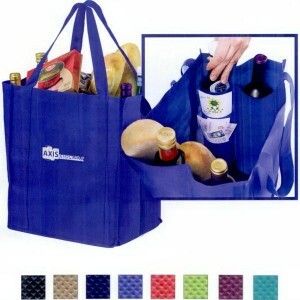 Wine and grocery tote 110 GSM non woven polypropylene. Includes 4 interior bottle holders and two pockets. Poly board inserts included for extra strength.